There are three different modes for this games: extreme, hard and medium. Apparently no one plays extreme because they’ve found it’s far too difficult, and medium is only slightly easier than hard. We opted for the middle ground (well, they told us that was how they’d set the room – we just went along with their suggestion). You are archaeologists, excavating the lost tomb of Ramsess III, so far, all of those who have entered the tomb have not returned. 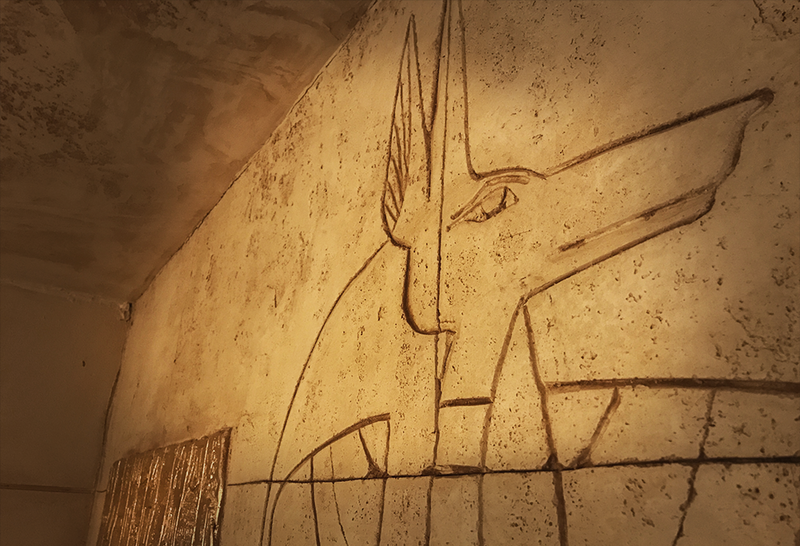 The tomb is guarded heavily by Anubis, God of the underworld. Grave diggers and previous archaeologist have been rampageous in their efforts to discover the lost tomb, the whole crypt is in disarray. Do everything you can to help Anubis and please the gods. But be careful, we know that Anubis is easily angered. Your mission is to find and restore the missing canopic jars and allow the pharaoh to pass safely into the afterlife in order to make your escape. Welcome to Egypt. If you’re looking for a well-themed Egyptian game, then congratulations – your search is over. It’s not quite as good as their Pirates of Polaris game but that’s a ridiculously high bar to measure against. If you compared it to the vast majority of games I’ve played, this would come out on top. Whether you’re looking at the high-level grandeur of the room or focusing in on the details such as the absence of padlocks, I think you’ll be pleased. It does get one over on the Polaris room: the clue system here is entirely on theme. Talking to them after the game, they have plans to improve it even further to add even more character to the room. One of my – somewhat selfish – worries with this venue is that they’ll get caught up with constantly improving their existing games instead of producing more experiences for me to play! It’s on the puzzle front that this game comes into its own. Some of the puzzles could feel a little bit repetitive in places, but they made me think harder than I’ve had to for a while. There’s deliberately very little direction about what should be used where, so you need to work hard to make connections. Indeed, it’s not even obvious at times what will be of use at all. The flow is nicely constructed so that there are various puzzles open to you from the beginning but several hidden away so that you don’t get too distracted. As the game progresses, there are a couple of key moments that unlock some additional items that you’ll find of use. As a pair, that worked fantastically well but, even as a larger group, I think the puzzles on offer benefit from a team approach, so I wouldn’t be scared about coming along with more people. Obviously, in a game where it’s not always clear what puzzles you have in front of you, knowing how you’re progressing could be difficult, but there are a couple of sets of clues/props that you build up which give you a decent sense of how you’re getting on. Twice during the game we encountered puzzle varieties that normally frustrate me because I lack some of the skills required to solve them. Both times they’d nailed the implementation. Don’t get me wrong: as with any puzzle, there will be some people who are excluded, but they’ve taken some reasonably straightforward steps to solve the inherent issues. Those design choices speak volumes about how carefully they think about the construction of their games (or possibly just how naturally it comes!). If there was one weakness to this experience, it was the finale. The last couple of puzzles didn’t feel quite as crisp as the rest of the game, and there were a few rough edges with their physical implementation too. Judging by the conversations I’ve had with the owners, if that view is held by other visitors, I’m sure they’ll be polished up soon enough. We escaped the room in 53 minutes having taken around four clues. The cluing system here is clear and on theme – I’ll say no more about it, though. If you’re after a more puzzle-intense experience, then Egyptian Exodus is an excellent choice. While those challenges aren’t as numerous as in other games, they are at the more difficult end of the scale and still have very gettable solutions. On top of that, you have an immersive experience which, while not quite as good as their Pirates of Polaris room, is still well above any of the vast majority of games available. How many people you choose to take along is very much a personal choice. We played with two, but there’s plenty of puzzle fun to go round (at least in terms of effort if not sheer quantity) and, in such a beautiful environment, just being in the room is a joy. For the right people, a full team wouldn’t present a problem. Puzzles and immersion? You spoil me, Margate. Head along to play – you really can have your cake and eat it here. From what I’ve heard, they’ve tidied up the finish a bit to make it a little more crisp so hopefully you had quite a smooth ending to the game. I’m excited to see what they produce next.